Do you want to have a luxurious lifestyle? Do you want to travel? To eat at nice restaurants? Maybe you want to start your own business. It's really important to consciously think about why you want to be rich. If you don't, it's easy to get caught up in a race to get more and more money without ever knowing why. this is the stronger one to me.. I dont think I want to be filthy rich, but I want to be comfortably well off to do the foln.. Your post made me think more than my usual comfort level about richness associated with money. Thanks! i want to live comfortably in life, take care of family and start my own bussiness. But the main reason I would like to be rich so I could give more to help people in need. That more important that having high quailty things when you can be happy with just he basic. It nothing wrong with having nice things in life, but difference would it make if you ate your food on a $10 plate than a $400 plate. You love pens! How fantastic. This made my day. Dear Ramit, good point with asking this question, however… don’t you think that there’s a more important one really close, that is: “why do you want to live?”. You know, long-term goals, things like that… sound pretty big. I was just surfing tonight and stumbled across your blog. I haven’t read all of your articles, but I have yet to find a definition of what rich is. If it is here somewhere, I apologize. I think it would be useful if everyone knew what rich is. Rich or Real Wealth is not a specific number. It differs for everyone. Rich is being able to maintain a lifestyle from your investments only. And the real secret to obtaining this elusive goal, is to not change your lifestyle until you rich this point. At once it is obtained, it is easier to improve the lifestyle you are currently living. So if you can maintain your current lifestyle for a month, you are already rich. If only rich for a month. What you want is to be life long rich. But other than that, most of the information here is dead on. Getting rich is not easy, but its not hard either. It only takes time, patience, a plan and execution. I will check back in on you from time to time and see what nuggets you have uncovered. Maybe give a little advice on how to actually trade/invest. And one more point. Never listen to anyone who is not better off than yourself. Just the opinion of a someone who is rich. Why do I want to be rich? 1. Having the money means not having to worry over things that won’t matter in 50 years. 2. We want four children. Forget raising costs, think about college! 3. We don’t want a terribly extravagant lifestyle, but we do want to raise horses. This requires serious $$$. 4. I want to homeschool my children… this means that either myself or my husband would almost HAVE to be a stay at home parent. 5. I want to start my own theatre/voice school (just graduated Voice Performance), preferably as a not-for-profit “teaching theatre”… not high-rent professionals, but kids & 20somethings getting their feet wet & learning the ropes. 5. Once we start having kids, we don’t EVER want to move again. And for four kids, a fair-sized house will be a good thing. Oh, and this last guy? He’s dead on… never listen to anyone who is poorer than you. They obviously don’t know what they’re talking about. Beyond that, I don’t really know WHAT to do… we’re very frugal, but as for investing… we’re clueless. Hey plz help me ? Yes before undertaking a plan its nice to pursue reason, if only for a very brief time. I would like to be rich so that I could have greater controll over my life and others around me. Like right now I am moderately poor. So I don’t choose what food to eat and when. I eat whatever I can get whenever I can. Sometimes I eat multiple meals in a couple hours of food I don’t like because its free. So I would like to controll and plan my life more. But mostly the biggest reason I want to be rich is because everyone else likes rich people and wants to be rich themselves. So in order to make those around me more happy and comfortable I would like to be richer. It may sound shallow but its the truth. I am working on begining my own buisness as well, do not know what buisness yet though. Im 19, working in real estate, and hopefully I too want to retire my parents so they would no longer have to work , and i cold keep them by my side forever. Freedom and Fear. I want my freedom. I want to be rich, because I am afraid of being poor. PS Ramit- fabulous job on riding the Why We Want You To Be Rich wave (PR and SEO wise this week I mean)- your site traffic should be through the roof! I hope people stay and learn! “Making career decisions because I want to, not because of money” adds a fresh perspective to my thought process. I wd love to go back farming in my native place. But I’m stuck in a job faraway. More than that my wife and kid would not like to come with me. I don’t hv any clue to what shd I be working at??? I want to be rich, so I can be free. Free to live my life in ways I choose. Free to spend time on things I’m passionate about. Free to pursue my goals unabaded. Xin sums it up pretty well for me too. Money doesn’t solve your problems, but the lack of money creates problems. teach me to learn how to fish, but don’t teach me how to eat the fish. in short; l would be happy if you teach me how to management my finances and move on in the right track. thanks alot for the education. food, shelter, day to day expenses & helping those in need. Travel the world & experience other cultures. Love the blog. I was just wondering: what would you say to someone who agrees with everyone you write, but intends on going into a very low-income field (academia) and doesn’t have a lot of start-up capital (so to speak)? Yes, saving and starting early (not even 20, so I’m good there), but can you teach me to be okay with being lower middle class? I think this website is the best resource I have seen about “getting rich” I have read books from Donald Trump to RObert Kiyaski ‘or what ever his name is ‘. I have dedicated my life on becoming rich because I grew up in such a poor state”no food,no clothes” and I believe that a little hard work will produce all the things not only want but need. I want to be rich so I can be hermit. Just hole up in a nice place and have things I need delivered to me. Being rich means having to envy the super rich, i.e. the ones with billions. While I’m enjoying my deluxe sedan they are flying around in a jet. When I’m enjoying a swim off my boat I’m staring at the island they own. I simply could not handle it and it would me very unhappy. I’m korean guy, this topic is interest and impressed to me. ofcourse i want to become a rich. I want to give my owns to others as my ability. Rich… for me is not having to do anything. Not because I want to do nothing, but because I want to have complete freedom over the use of my time. My plan involves me having to put in roughly half an hour of work every day, but I think that’s reasonable. I think I’ve been failing so far because I’m not making any goals for ‘right now’, and because I’ve gone too far pursuing my current lifestyle, which I don’t want. I want to live on the water, in the tropics, to build, and have financial freedom, and I’ve married a seasick Canadian woman and had a daughter. or have Just Over Broke those of you who cant see what I mean just over broke means to have a job or work for someonelse I want them to own investmenst they can make money with without ever having to set foot in or around, this is one of my own personal goals I have set I have been working at this goals for almost 10 years and still have not found the right kind of investment as of yet! I’ve worked 28 years at a job I can’t stand and which I feel is essentially morally wrong. But I have not made it as an ‘artist/writer,etc’. So I’ve put my life on hold for the past 28 years. I have two years to go to get a pension and then hopefully I’ll have a few decades to pursue my art, my writing, my freedom. Money to me represents freedom. There is nothing I don’t have that I could not buy at this point in time,however, one can’t buy one’s freedom w/o survival dough! Money for me is not a materialist trip, it allows me to live as I prefer. So I wait and wait. It’s a checklist of the things you want to do in your life, as well as a social community based on it, with tagging and such 2.0 things. I use it to keep track of my goals and deadlines. I WANT TO BE RICH, period. AND there is plenty i can do once i have al that money in the universe. I am 51 years old and I have worked hard since the age of 13. My ID was stolen in 2005 and it sent me upside down. My wife and I have help many people over the past 25 years and now because of one person we were helping we face loseing everything we have. I would like to have enough money to be able to help my mother and wife with their medical problems, save our home as well as my credit. Ant funds needed to help my brother build his church so that he can help people. Our dream of dreams was to have enough money to live a peacfull life for our time remaining. and to build a small ranchet for children that are termaley ill to come to and see the all that God has created and to stay untill there time here has ended. Better that being in a concret building waiting to die. I am asking for help this time. I wanna be rich because of one single word “Security” … I wanna be able to support my parents when they get sick. I wanna be able to send my kids to school and college. I wanna be able to help others without suffering my financial plan. I want to be rich because of something called “security” Im afraid everyday when i wake and look into my sons’ eyes maybe im not here 2morrow then what? what about him, his future, where to live, education and the rest. Money, it’s def not everything, but it does help. I want to be rich because this is the God’s thought when He created me and sent me into this world. It is was about to have riches and honor to gives like Himself, prosperity and success. This desire is like a burning fire in my heart and I can’t escape it. That’s my real raison of living on earth. You love pens. A much better idea than the lady, who had collected over 2000 cookie jars…..all over the house! My wife loves writing with fountain pens. And I, being a mailcarrier, collect letter openers. I just came across your website today coz I was looking to learn about stocks, bonds, future investments. Take care of my mother when she’s ready to retire without her having to worry about bills etc. I want to pay off my debt that incurred from a car accident I got into; and my father gave the insurance company a false statement to teach me a lesson, leaving me at $20,000 debt at the age of 18. I am now 23 and it’s not paid off yet. Extra money to help pay that off would be great! I’d like to buy a new car by next summer. I want to buy a house for my mother and I before I’m 28. I want to give back; help educate children in India and South Africa. I would like to be able to rest. I’m whipped.Physiclly and emotionally. I had dreamed of being a singer/songwriter since 13.Became a father at 19 and have provided pretty well for all three kids and my wife by working my tail off for other people and just getting by,to the point I blew my back out. I have gotten burnt by just about every one I have worked for, but cannot seem to focus on becoming finacially independant. Either the starting capital isn’t there,or I run into empty promises that never seem to pan out.I feel blessed that I was able to provide for my kids,and build the house that we raised them in with my own two hands but now their grown and gone,I’m 51 and have $25.00 In my 401k and no other savings but the equity in my house. I’ve spent most of my spare time in my music room trying to get good enough at my music to maybe be able to save myself from total poverty but I’m emotionally drained.I’m rich in so many ways like,being with my 1s’t wife for 32 yrs,having a wonderful relationship with all of my kids,and 4 fabulous grandchildren but, I can’t afford to take them anywhere or buy them anything.and when they have needs, I feel guilty that I can’t help them or anyone else anymore.So for all the young people reading this, don’t put all your hopes and eggs in one basket.and think about YOUR future. It will be here sooner than you think.They say money don’t make the world go round but, it sure greases the axle that it spins on. I want to be rich, so I can help those in need, so I can live the life I want to live. I’m a giver not a taker, my happiness comes to see other people happy from my help. i don’t know that is meaning of wanting to be rich or not. I just want to be the position i can support my kids, my parents, my sisters and my brother if they have problems about money situation. But seem …yeah i have to have enough money !!! I want to be rich so that I can do something with my life that I want to do without worrying about the financial situation. I don’t want to get a degree in a field just for a job that has a good salary. I want to do whatever makes me happy. That, and I’d like to retire my parents from working and give them a care free life for the many sacrifices they have made for me and my siblings. i am sick of struggling with two children and all neccessities left to me. I want to be rich because it would be fun to be more generous with time and money. Why do I want to be rich? When my son asks me if we can go to a soccer game, I could say, “sure, when?” Instead, my answers are – “How much does it cost?” and “I have to work.” Children grow up so fast, and this time is precious. I should be spending this time with my kids instead of spending every ounce of time and energy just to provide the necessities. So I can really choose what I want to do with my career. To be able to paint and write. To be able to persue my goal of self-education. To be able to not stress over the nexessities I need in my daily life. Iwant to be rich.What I consider rich,not what others might consider rich. I know what it means to not have anything and I know what it feels like to spend most of your time thinking about being broke. I want to know that my children and family will do well and that means that I need to do well,and I will. Ramit, I don’t think many people will grasp just how powerful a concept that is. Whether we like it or not, this is a material world. Money drives the vast majority of our everyday decisions. I don’t love being an analyst….if my wife would let me I’d follow my dreams of being a writer or rock star….or anything BUT being an analyst. But I am good at it and it is intriguing. And I have become accustomed to the lifestyle that Wall Street salaries pay. And money drives where we live, what cars we drive, what schools we send kids to, etc. I ahve become a slave to the lifestyle, not that I am complaining or ungrateful. It is simply the truth. Others much less fortunate as I are just as trapped. They make decisions based on their current station in life financially and make those decisions on a day-to-day basis because the demands of TODAY obscure the bigger picture. They drink that $5 latte ( I know you hate these examples) everyday and then complain that they don’t have enought money for this or that at the end of the month. Bad decisions are made because we don’t plan and we fall victim to liveing our life the same way we did yesterday…We weren’t happy with yesterday’s outcome and if we do nothing different, why are we shocked that today turned out no different than yesterday. I do not want bills to run my life, similiar to your idea. Don;t want to have a stress avalanche if the car breaks or the water heater goes out, just want to pay for it and drive on. It amazing a thow many people are amazed that me and my wife tell our money what to do. The power that it gives you. I feel that being free of debt is key to gaining fianncial peace, unleashing the true power of your income. I want to be the start of a legacy taht changes my family tree forever. Have the following generations start off at a higher point than I did and keep up the momentum. I want to be rich, so that money is never the problem for why i or my family can not do something. I hated the fact that when it came to family decision it eventullay came down to money issues. because, put simply, I want to bring a lot of children into the world and I want them to be comfortable and I want to spend a lot of time with them. Seriously, I want like 10 kids. because im tired of living in poverty…living day to day selling my personal belonging to make something so i can eat, or have gas for my car. Because i came from a family where 26 ppl lived in a 4 bedroom house. i want to be rich, and be able to take care of myself… and because i want it to be better for my kids! Don’t wait to become rich, decide to become rich. That is what we are doing. My son is a freshman in college and I want him to see his parents pull themselves up and make the decision to be rich. When we thought we were going to lose our home my husband said the worst part was “we were this close.” We weren’t meant to come “this close.” Jesus came so we could have life and to have it more abundantly. So that is what we are doing, planning to live abundantly. I will be a writer, my hubby will make furniture for a living, we will afford living expences, college for our son, giving to ministries, travel in our RV when we retire (another dream) living and loving life to the fullest. Remember if nothing changes, nothing changes. Change your life “decide” to become rich and make it happen. Good luck to ya’ll and God bless your journey. Why not listen to someone who is poorer than you? Or not better of than you? You don’t take their advice of course but their is alot of information in their stories of the mistakes they have made to learn from. Now this is a nice blog. I am so happy that more and more people realize that wanting rich and becoming rich and being rich is the noblest thing you can do for your self. 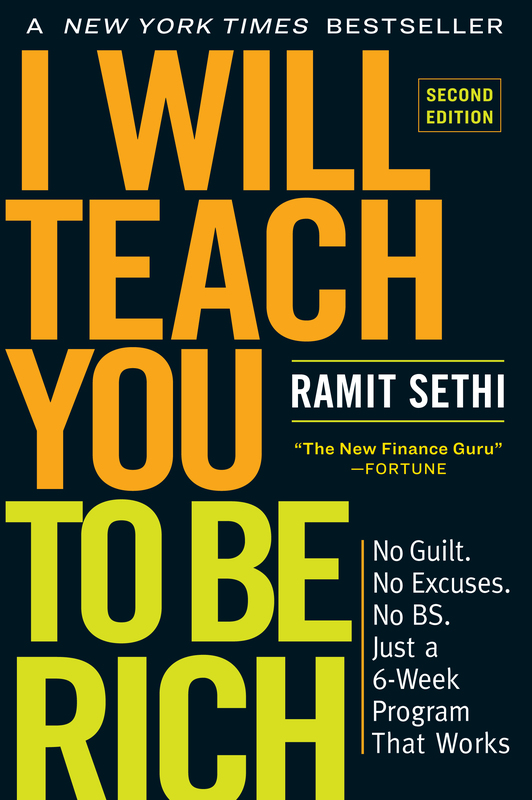 Ramit Sethi you are the man. I too, teach people how to get rich. It is a nice blog. I agree with most of the people here. BEing rich can be very important under some circumstances. But it is also important to be lively and happy. I want to be wealthy because I am insecure really, having endured countless failure in the past through naivety and possessing a huge ego which makes me a very competitive individual. I want to rich because I belive it means having a wonderful life. You can do whatever you want and not have to worry about things like bills. They say having more money brings more problems but I say…I’d rather have rich people problems than poor people problems. Im not trying to help everyone it would be all about me. Maybe thats why God hasnt allowed me to have much more than I already have. Thats ok. I’ll keep asking him and maybe he’ll give in. Soon I hope. I dont want to be old and broken down before he blesses me. I want it now. being wealth is very sweet and all you want comes to you don’t relax waiting for things to change, change it yourself and be rich…call baba today +2348136589897 and become rich as you always want. I don’t want to be filthy rich, just have enough to help my Daughter’s and My Grandchildren and some of my refugees that I have been helping since 2002 . I have been poor all my life My father passed away when I was 5 and My Mother was Mom and Dad and although she worked 2 jobs to keep food and a roof for us we never had much of anything and so the cycle continues. I Love helping people out I think its my calling I Love seeing a refugee family thrive and know I was a part of it … even if I did not give them much they though I gave them the world. God Bless you for making this program available to people that want to better the lives of their Family. – Living seperately from my husband’s big family. – Work on my desired job not the job that pay the most. – Funding my kids education. In order to be rich you must have to know your WHY. Some people have a stronger WHY then others. Hence some will actually go after their goal to be financially independent. The unfortunate reality is that many turn to things on the internet and are taken for a ride with the promise of making huge amounts of money. It’s time to get back to reality. Yes it is possible to become rich working from home and using the internet, but it’s a huge learning curve. So unless you find a person with integrity and some smarts your chances are slim to be rich from online enterprises. Just keeping it real. I do very well for myself online. I wish most of you the good fortune of finding something you love to do and THEN the money will follow. I live in Tashkent capital of Uzbekistan. I’m 17 years old. I have many dreams and between them the dream is to be “rich” ! I don’t “want” to be rich. I “will” be rich! this phrase I like very much! How do you feel, when you want the best for your family and you can’t, becouse you have a non chanse to be something…. I loss almost all my hearing perceptions… I have a academic degree and? I can’t do nothing with…I t is like a dream. I can’t bealive that!!!!!!!!!!!!!!!!!!! how to help others when I can’t help myself? I want to be rich because I’ve done almost everything for everyone else and I’ve never asked for anything in return. I know that we should do things because it is Gods will and I’ve seriously tried to do that. Ive even given until it has left me broke and without any means for months and then I get behind in bills. I work so hard everyday I’m a music teacher and I’ve had big dreams to have my own recording studio. I just know that with all my giving that will never happen. I can’t even afford to get married to the love of my life because money is streched so thin. I’m just tired of coming home everyday to a new bill and a phone call from a family member that ask “can I please borrow some money I have to pay rent or buy food I swear this time I’ll pay you back” Money although is not everything it will do great things. I’ve grown up poor and my family and I have struggled since I can remember. I just want to have the money so I can still give and also have for myself. I do thank God for what he has given me a women who loves me, a job that gives me the means to help out my family when i can and the opportunity to do and go places people only dream of (but even that has left me bone dry). I believe that I deserve the chance to live my dreams and that will only happen if I am rich. I am extremely shallow. I want status, wealth and control over my life. I am not into flashy cars, private jets or swimming pools, etc, but I do like antiques and want a big country estate designed by myself, with huge grounds that I can turn into a park for local people. I guess I want to display status, but in ways that make other people happy also. I want to collect all the old leather-bound books that end up in the backs of antique stores and create a massive library that has that dusty smell of polished wood and old leather. I want to open and run my own classical atelier and work with and train fine artists. I want the freedom to wake up in the morning and really be able to choose how to live that day. I want to be able to sit and work on and finish my novels for weeks on end without interruption if I so choose. I want to be able to pay for all my family’s needs. I want to be respected by the people I respect. I want to travel to every country in the world. Those are just a few of the many goals I have. I took your advice and compiled a folder of every single one of my goals. Some of them I can obtain by other means, but other than that I have many years of hard work and severe frugality ahead of me. I’ve crossed out my ‘rich by 30’ goal as that is completely unrealistic unless I win the lottery! But I do think I can reach the million mark by 40 if I put in the effort. I had to decide whether to give up my time and life now to reach that goal, but I’ve decided it’s worth it. Even if my descendants are the ones who enjoy the wealth rather than me. My grandad started off the pattern of working my family out of sudden poverty and I know how much my family respect him today. I want to earn that same respect. If I earn respect from others outside my family along the way, then even better! I don’t want to be”rich”, I am rich with the love and health of myself and my children. My faith in God makes me rich as well. I work very hard , I am a nurse with two teen aged sons, but we are always scraping change from paycheck to paycheck, especially just to pay for insurance, groceries and gas, lights and housing. I have cut corners in everyway imaginable. I just want to be able to do something, besides pay bills and work all the time. We barely have money at the end of the month for groceries and gas. I don’t mean to whine, but I guess thats what I’m doing. I don’t like asking for money. What happened to my ingenious remarks that were posted? I want to wealthy beyond measure. Now I know that is shooting a bit too high, but I want to do everything I want to do when I want to do it. Fly to Vegas to go to a restuarant, then fly to NY for a Knicks game. But honestly helpng others achieve thier true potential is good too. I love children and they make me smile more than anything in the world. I want time to get educated, and time to read all the books I wnat to read. I do not how or when but I know I would like to be a wealthy women. I do not want to spend the rest of my life spending the majority of my time working long hours and not to be able to enjoy what I like to do. I would like to be rich so that I can truly enjoy what life has to offer wihout having to worry. I hope I can find some inside or encouragement into how become a weaLTHY WOMEN. It’s more than having allot of money. As it’s been said money can’t buy you happiness but it sure doesn’t hurt. Money is a great tool but a terrible taskmaster. I’d want to be come successful having the feeling of accomplishment as well as fulfillment. Money alone can’t achieve this. Many wealthy people are the sadist people you’ve ever met. And some of there children commit suicide. So money alone isn’t the answer. But the ability to live and not have a concern of the next bill coming or if I dream about going to say. Australia I can go because I have the means. If my dad or mom needs a little help I’d like to be able to be a blessing to them. I’d like to be able to see someone I befriend say on the street in a grocery store in a restaurant that is struggling but is sincerely trying to make it. I’d like to discreetly help them turn there life around in a major way. Because I know if some one did it for me I’d be thankful. My goal to be rich: So I can help my parents, who helpped me. And so that I can do activities, like go to lazer quest, go sky diving, go golfing, go hang gliding, go sailing, play poker for fun, and do all those fun stuff. I would like to say like almost everyone who wrote here that I want to be rich, but I won’t say it; instead what I will say is I need to be rich. That’s for sure that I need to be rich just because otherwise there is no sense that I do live this life so far. There should be a reason that I am here on this earth and I need to be rich in order to fulfill it. This website is my 1st step to be rich. i want to be rich an hard working , because i feel my parents have help me loads since i came into the world and id love to be able to pay them back , im only 19 an i would love an amazing future for myself an my family , we dont really have alot of money but i will never moan about it because i am happy because my family are loving , it would just be nice to achieve something , i am a hair dressing student an currently on my level 2 , business is my long term future , i get angry with dreaming because i want it to be a reality, i no im only young but achieving my goal would be amazing , what would you say to help me , an where to take my next step for my future after i have finished my last nvq level 2 . i dont want to sound like i am selfish and i dont want to come across as another money maker, i want to help others , becuase i no how it feels to struggle in life it would be lovely to get to my goal . I want to be rich because I am not fit to work, i have mental disorders and would have to rely on Disability to live. That is clearly not enough money, and i wouldnt live a normal life. I have always felt that there is more for me in store than where I am at. I have already made the leap and worked my own house-cleaning business for the last six years. However, I have since been either afraid of or unsure how to proceed. I know I don’t want to be cleaning houses when I’m 40 and I have always been good with money. I’ve been good with money but not great. I am good at tracking my budget and forecasting three months in advance. I tend to make my meager income stretch more than the average person. However, I never seem to get ahead. In fact, in part thanks to the economy, and in part thanks to my recent divorce and moving, I have a significant amount of consumer debt I cannot refinance. So, though my cards are no longer in use and I am maintaining purely on cash now, I do not like the idea of paying finance charges forever. Also, like I said in the beginning, I always thought there was more for me. Maybe 2009 is the year for me to get serious about a “get rich” plan. Not in the billionaire sense maybe, but in the set-for-the-future way: money saved, minimal living, money for travel, secure in my future. If I were to do this, my first bit of homework would be to think out and create my own accountable list of goals. That may be the hardest part. I tend to live for the now, and that can be a problem. This requires a bit of thinking. I want to never worry about (my family) needing. AND, I would like to go EVERYWHERE comfortably. I think it would be so much fun to do so and you only live once. I am currently working because I have to. Enduring inadequate pay and injustice at times. I want to be rich so I can live my life to the fullest and not just survive. I know people who lived to pay bills and died in debt. I want to be rich so that I can live a truly meaningful, fulfilling life by being free and capable to do whatever I want, whenever I want. I want to touch lives and bring joy to as many people as possible. Being rich to me is the only way to be truly free in this life. Being rich solves alot of problems. Obviously not al,l but i would say 98% of my problems. I still belive! Must commit! I do not like the rich word. People who use it tend to be uneducated i prefer wealthy. There are many reasons i would like to become wealthy or financially independent. For starters when you are wealthy you don’t have to worry about whether your going to have a job tomorrow or how your going to pay for basic necessity’s. Wealthy means that you and your family’s future are set. no matter what happens tomorrow and that is a good feeling which sadly not many people know what that feels like. Another reason is i wanna be able to take care of my parents and take care of them. They have always provided me with things i needed so they should be provided with the things they need. I also wanna do some type of mission work and help underdeveloped countries build roads and bridges which i am an engineering major so i could help them out in many ways. Our county was built on these principles to life, liberty and the pursuit of happiness Thomas Jefferson knew what he was writing when he wrote that. Because happiness is not a place you will never get there it is a feeling and is self fulfilling no one thing will ever give you happiness it may make you happier but it will not fulfill you. Being wealthy is not a place you can not get there. it is a gift and to whom much is given much is required. when you do finally become wealthy there is more things that require your attention its just a matter if you are going to ignore them of pursue them. I am rich! Iam Rich! I AM RICH!!!!!!! I am 26 I own two businesses, land, houses and shares. Everyone starts with nothing and WANTING to be rich is hoping you will win it. I have what I have because my mindset says im rich already and everything else eg money comes flooding in when you beleive it. I want to be rich, I am nearly 45 and stil single mother… All my life I tried to work hard and think about tomorrow, not today… I am really sick of being in short of money and be afried to spend little more on myself… I want good life – really, I think I decerve it! Honestly, wealth is good for man livelihood. Is an answer to almost everything. It’s also a determinant of standard of living somebody desire for himself/herself. Therefore, i desire richness not at all cost to make me be fulfilled and affect my generation positively. i think everyone wants to be rich in someway or form ,, we all want not to work but to havethe time and money to let us truley enjoy life ,, yes sometimes work itself can be rewarding but 95% of the time it isnt ,, and hand on heart threre is only a small minority of people who truley enjoy there jobs , there for i want to be rich to enjoy my life with my kids and not be working 12 hours shifts over a weekend !!!!! I want to be rich so i can carry on my grandfathers work, which is to reduce poverty in Bangladesh, we have it soo good here living in these rich countrys, i’ve seen true poverty in Asia and it makes my heart ache. Im doing good so far got a mini successful business in the stock market and my retail business is just starting to boom, soon after five years when ill be wealthy im going to visit my ancestors home country and thats when ill be able to make some real change. To me poverty is evil to all of mankind, nobody should be starving and nobody should be homeless. unfortunately this is the way capitalism is built. I want to be rich because ihave afamily 5 children to cater for. I want to be rich so I can move out of my mom’s house. You have to be rich to get a house and live comfortably. That’s all I want is my own place. I want to be rich, definition of rich for me is to eat lobster at a beach house ..before I die …at least something that would make me feel good about myself.. I don’t want to be rich, I don’t want to be wealthy. I just want to be able to buy groceries without knowing I’d probably have the lights turned off because I bought food. I’d like to be able to buy a pair of new shoes without worrying what part of my budget I was taking from just to stop getting blisters on my heels. I’d like to stop having seizures and be able to afford the medication it would take to stop them. I’d like to, for once in my life, go to sleep without tears drying on my face because I know I don’t have a enough money to buy coffee to even have a single cup in the morning. Because I can’t, find any firm ground to stand on. Just one day…one day of waking up and knowing I can have everything I need. But that is not in my cards and wealth is something that I don’t even bother wasting time dreaming about. I wish anyone who tries luck, but it will never happen for me. Still this doesn’t make sense to me. I you want to make career decisions without worrying about money, just stop worrying. You won’t be a millionaire, but unless the only thing you enjoy is sleeping or doing absolutely nothing you can still make a decent amount of money. My mum is almost insane because poverty,no one to pay i and my brother and sisters school fees, we even dieying of huger please help me make this money,we also need to pay our house rent. I want be rich becouse i have strugled a lot. I want to help my mom,sisters,brother’s and some other people around me.i have grown in the imformal settlement i don’t wana die the. Please help the way you can. Just want to give you a heads-up that I created something that would be a great addition to an upcoming blog post on the topic (if you have any upcoming work on the subject). It’s a list of 20 reasons ‘Why Play the Euromillions’. Let me know if this is something you’d be interested in and I can send it your way to check out. you wanna be life long rich not a month. well, what am i doing here? , simple , i am rich , rich coz my kids healthy and i am healthy , the rest u can worry about later , reading the people messages its funny, u cant go forward by reading others opinions , get to work and make it happen , thats what i did , start small business as supermarket , then i get bigger and bigger as time pass by , right now have a store with 15 staff , i am not rich , but i am confe with life . I want to be rich so I can change people’s lives for the better. This is really important to me. They did so much for me, I want to give them something back and make sure they can enjoy their retirement. I have decided that i am going to spend the whole day on the internet just to make sure that a lot of people are able to read this my testimony about RAVIDATT VYAS who is a powerful black magic spell caster, After been abandon by my lover i was so lonely that i decided to go through the net for some relationships tips, I never knew that this was the road map that will secure the return of my lover. After reading a lot of tips on how to restore my relationship in a more better way i discovered that RAVIDATT VYAS has a lot of recommendation than other spell casters, So with this i had my mind made up that RAVIDATT VYAS was the right person for the job, And i contacted RAVIDATT VYAS through his email(ravidattvyas522@gmail.com) which i saw on the internet and i was so happy that i choose RAVIDATT VYAS because his work was 100% perfect and the spell brought my lover back to me with fast relief. I have a question .I would like to know if u are rich or not? I’d like to be rich so I can actually make a change in the world. I’d like to have enough money so I can study, psychology, business, economy etc, any knowledge I could gain to help me understand how the world works and to better it as a whole so I have the opportunity to educate my self and people around me. I’d like to walk the streets, find homeless people, educate them, have them work for me. Build good schools in poor communities and give kids the opportunity to make something of themselves. Travel to the poorest parts of the world and set up economies for them to have a level playing field with the rest of the world and support themselves. I’d like to redistribute wealth across people rather then the select few being filthy rich. If I had unlimited resources I would have a good education open to every single person in the world. Imagine a world where every single person was knowledgeable and highly educated to the point where they did things for the better of the world as a whole and not just themselves.